The report describes climate change as "one of the worst environmental disasters in human history" and predicts a future in which Spain suffers from extreme heat in summer with "heatwaves regularly reaching 50 degrees Celsius." This, and a rise in average yearly temperature of between 4 and 5 degrees Celsius would lead to a lack of water resources, although at the same time there would be increased damage caused by frequent torrential rainstorms. "The sooner the measures and policies are put into place to reduce CO2 emissions and lower the accumulation of greenhouse gases in the atmosphere, the sooner we can try and avoid these impacts," said the report. The report's stark warning was: "If we do not adopt these measures soon, the changes will be irreversible." 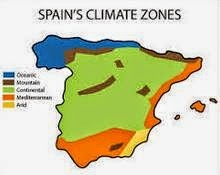 The study explains that given Spain's geographical situation in the south of Europe, with one seaboard on the Atlantic Ocean and another in the Mediterranean, the country will feel the effects of climate change more drastically than many other nations in the European Union. According to Gomez Cantero, the proximity to the Atlantic will leave Spain exposed to "huge storm systems," and the damage they cause such as flooding and coastal erosion. Meanwhile, the temperature on the surface of the Mediterranean can be expected to rise and Spain will be exposed to dust storms originating from the Sahara. As well, greater evaporation caused by higher temperatures, combined with reduced average rainfall, would see water resources fall by 16 percent, the equivalent of 20,000 hectometers of water. This would cause serious problems for Spanish agriculture, producing a negative economic impact, especially for olive, wine and fruit producers, while Spain's valuable wetlands such as Donana in southwestern Spain could disappear completely, the report said.